The results of a new poll published today in Iceland indicates that the Pirate Party has just become the country's most popular political party. According to the results, almost a quarter of all citizens would vote Pirate today. Speaking with TF, movement founder Rick Falkvinge describes the result as an "extraordinary accomplishment." The party is currently enjoying its second term in the European Parliament and in January 2014 Julia Reda MEP released her draft report for the overhaul of EU copyright. As pointed out by Falkvinge himself, that fact is worthy of a double take. “A Pirate Party representative is writing the European Union’s official evaluation of the copyright monopoly, and listing a set of necessary changes,” he wrote in a TF column. And today brings yet more news which prompts a second look at a surprising headline. According to a poll carried out in Iceland over the past week, the Pirate Party is now the country’s most popular political party. For a party founded locally less than two and a half years ago, that’s an astounding achievement. Run between the 13th and 18th of March by MMR, a company experienced in measuring support for local political parties, the survey places the Pirates ahead of even the most established of political movements. According to Visir, total public support for the Pirate Party is currently riding at 23.9%, that’s up from the 12.8% reported in the last MMR survey. The Pirates have snatched the lead from the Independence Party, who led during the last poll with 25.5% but have now dropped to 23.4%. While that is a slim lead of just 0.5%, it is a lead nonetheless, and the gap between the Pirates and other parties is even more pronounced. The Social Democratic Alliance polled at 15.5% and the Progressive Party now sits at just 11.0%, marginally ahead of the Green Party with 10.8% of the support. Today’s results are an improvement over those reported in a separate survey published last week which put the Pirates in a marginal second place. That prompted cautious excitement from Pirate MP Birgitta Jónsdóttir. “This is a poll and we are in the middle of the term, so we have no idea if this sort of following will continue, but it is a clear sign that our agenda, our core policy is something that appeals to almost quarter of Icelanders today,” Jónsdóttir tells TF. “People are sick of traditional politics and the revolving doors. They are hopefully ready for more responsibility for that is one of our main aims, to create platforms for people to be more engaged via direct democracy. People seem to like that we speak like other people and behave like ordinary people,” she adds. Speaking with TorrentFreak, Pirate Party founder Rick Falkvinge says the results of the poll are inspiring. “The suddenly-within-reach prospect of actually taking up a prime ministry in the near term shows what you can accomplish when you’re calling out stale policies and governmental backroom shadiness for what they are. It also shows how the net generation just won’t stand for the holier-than-thou attitude that’s still being displayed by an old self-appointed elite toward the young future. “Still, to get to this point requires extraordinary hard work, commitment, and dedication. Far more than just congratulations are in order. 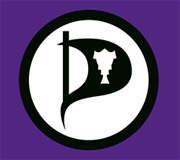 The Icelandic Pirate Party is an inspiration for the net generation of the entire world,” Falkvinge concludes.